With a master plan inwardly focused upon a "healing garden", the new hospital replacing the Anaheim Medical Center, crystallizes a destination point that links the property to future retail and residential developments and to the Anaheim Canyon Metrolink station. 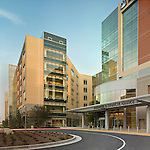 This phased project initially brings to the table a 262-bed hospital that houses operating rooms, labor/delivery rooms and Emergency Department bays. 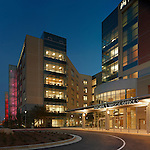 Also included i a medical office building, hospital support building, central utility plant, and a parking structure.